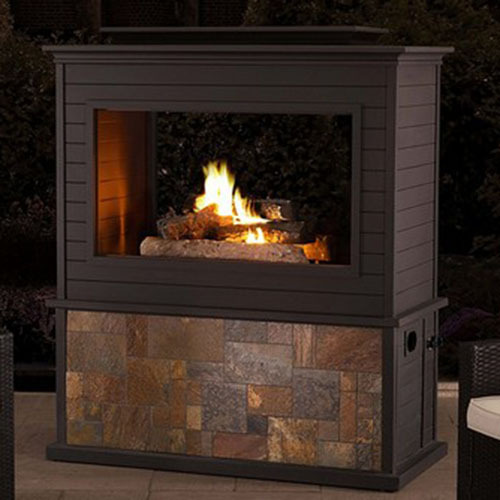 An outdoor fireplace is an area for making fires. It is constructed outdoors yet it has the same construction with an indoor fireplace. 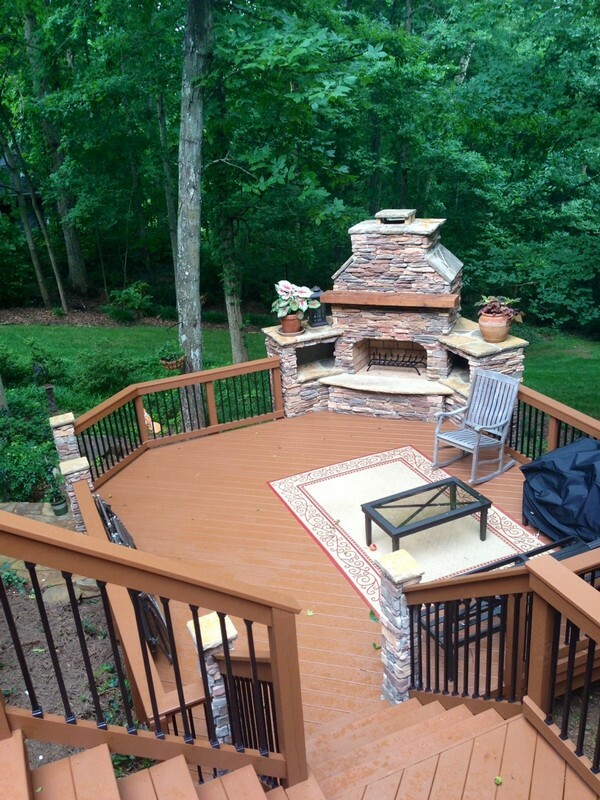 Typically it is constructed in a brick, stone or concrete patio. Most often it includes a chimney and a firebox. It is important to clean it regularly so that it can look excellent all the time. The purpose of an indoor fireplace is to provide heat while an outdoor fireplace is commonly used for cooking. However, it can also be used as a decorative component. 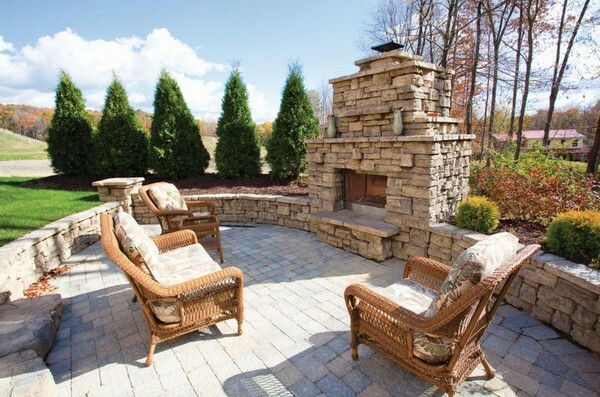 Create a fireside setting on your yard by creating an outdoor fireplace with the use of stacked stone. Step One – Make a design by measuring the width, length, height and depth of your outdoor fireplace. Determine the look that you want to achieve. For a traditional look, you can use bricks, while for a contemporary look use stacked stones. Moreover, choose whether you want to use gas or wood on it. Step Two – Construct the concrete foundation. If you don’t have a concrete flat area then you have to make one. Start by digging a trench and pour some concrete on it. Step Three – Place concrete cinder blocks then add mortar between them. Be sure to leave an opening at the top. Step Four – Create the facade. Cut 2×4 lumber and assemble them using nails or screws. Step Five – Affix the cement board. Cut the cement board and affix it to the frame using concrete screws. Step Six – Mix mortar and add it to the cement board. Apply it in sections to prevent it from drying out. Step Seven – Put in the stacked stone and make sure that there are no spaces left in between. Step Eight – Install the chimney cap. Ensure that it is tight on all sides. 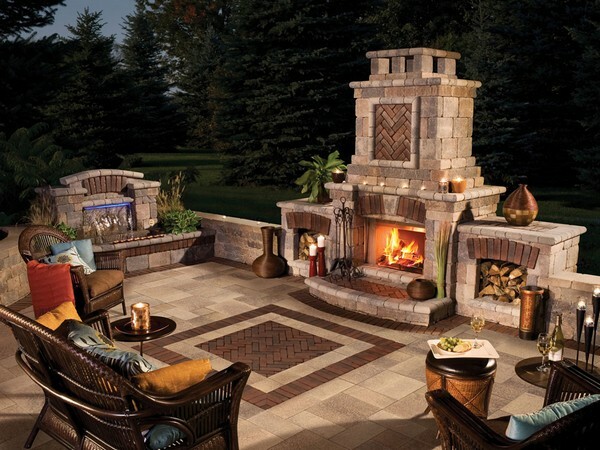 Nothing beats an outdoor fireplace in an outdoor living room. 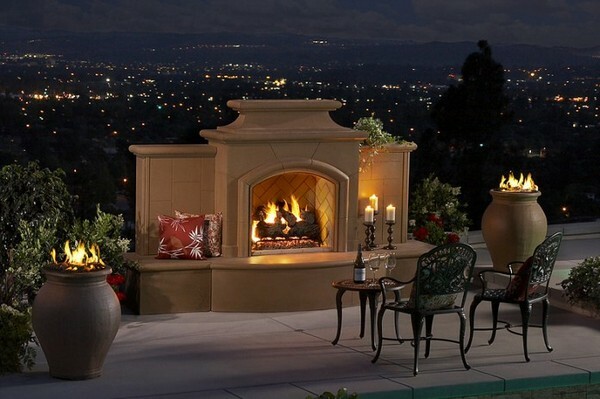 Nowadays, outdoor fireplaces are becoming more popular. 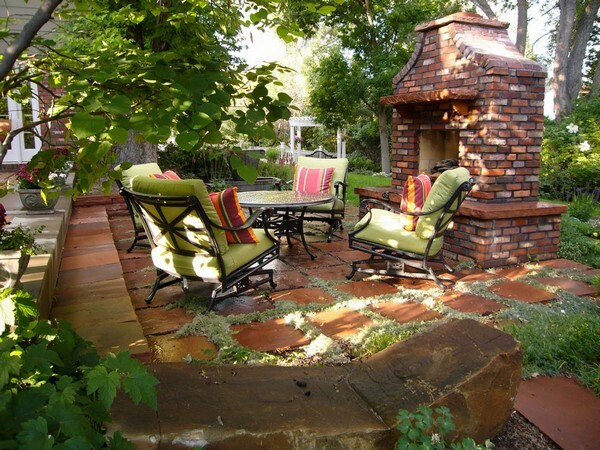 Most homeowners are now more interested in outdoor fireplaces rather than just firepits. 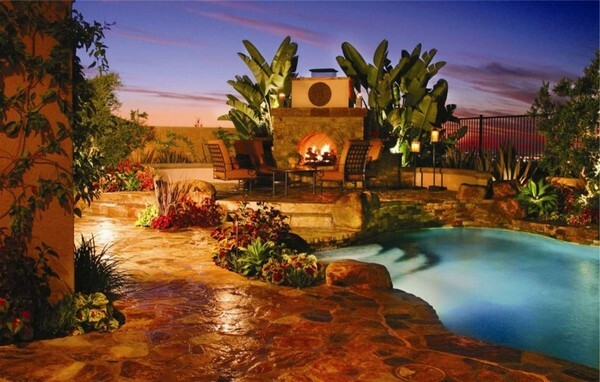 When it comes to designing your outdoor living spaces, your choices are overwhelming. You may want to add some furniture, water feature, plants or flowers. Nevertheless, there is nothing greater than anchoring it with an outdoor fireplace. 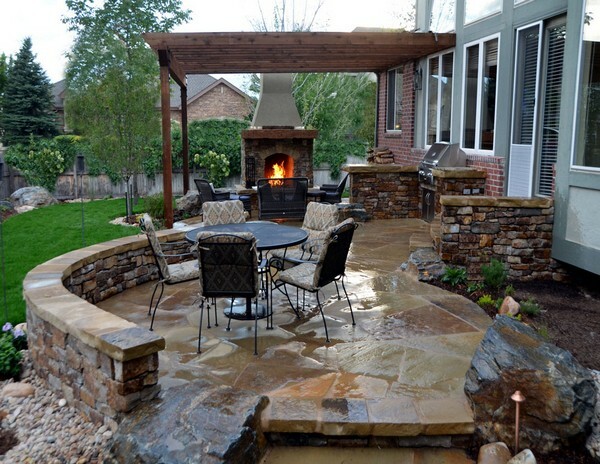 Should you build a fire pit or an outdoor fireplace on your outdoor living space? No matter what you choose, there’s only one thing that’s certain, these fire features are definitely hot! 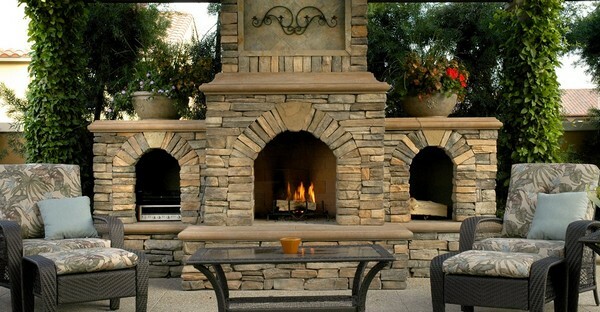 Most outdoor fireplaces are made of stone or brick. It comes in different shapes and sizes. The classic sofa is a good match for this outdoor fireplace. 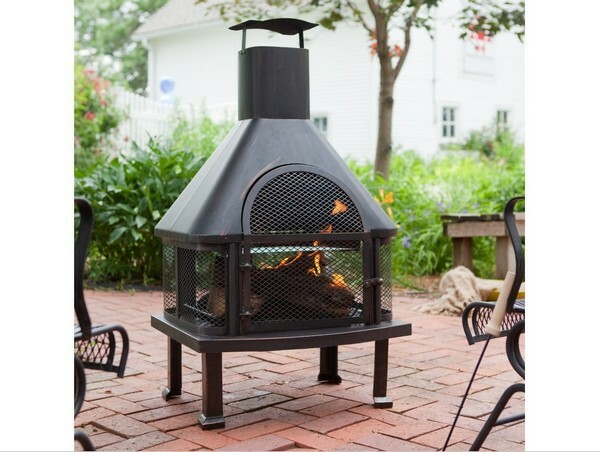 It is very important to choose an outdoor fireplace that fits your yard. This outdoor fireplace is placed beside the hot tub. Isn’t it cool, or perhaps warm? The slide looks fabulous too! 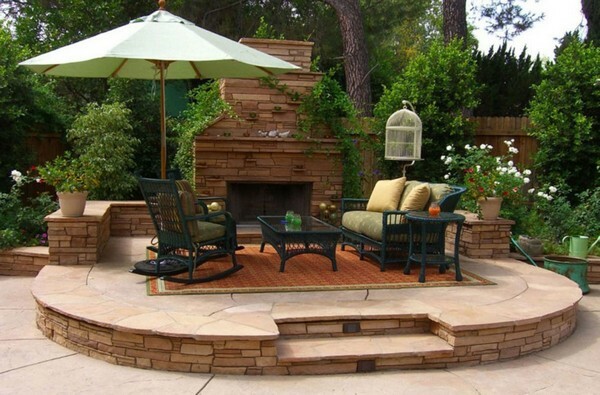 Your outdoor fireplace will become the main attraction of your outdoor space. 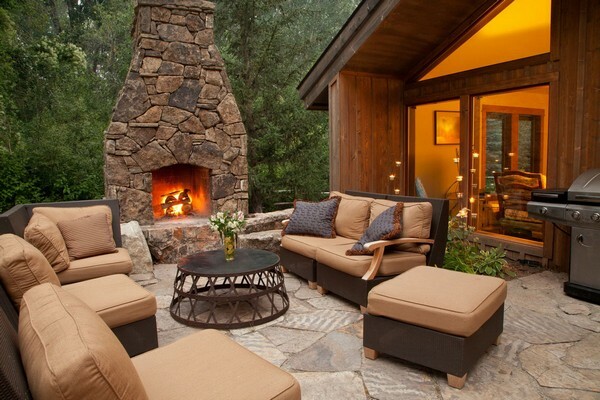 A nice fireplace in the outdoors can provide warmth and a comforting feel to the area. 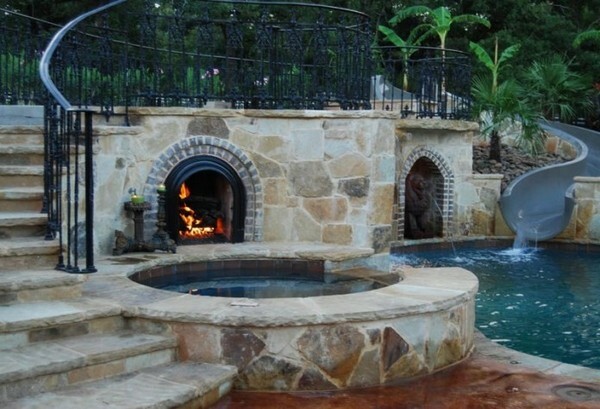 A fireplace can be an excellent decorative element for your backyard swimming pool. 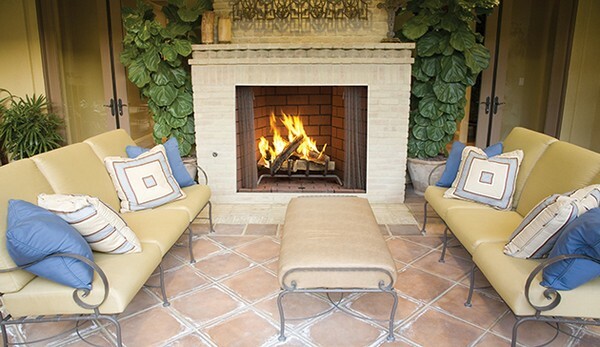 An outdoor fireplace is a perfect place for putting comfortable seating to entertain guests. 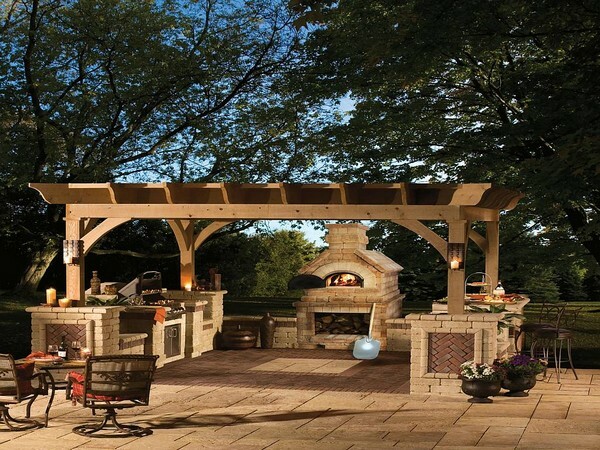 Your friends and family will surely love the atmosphere of your outdoor fireplace. 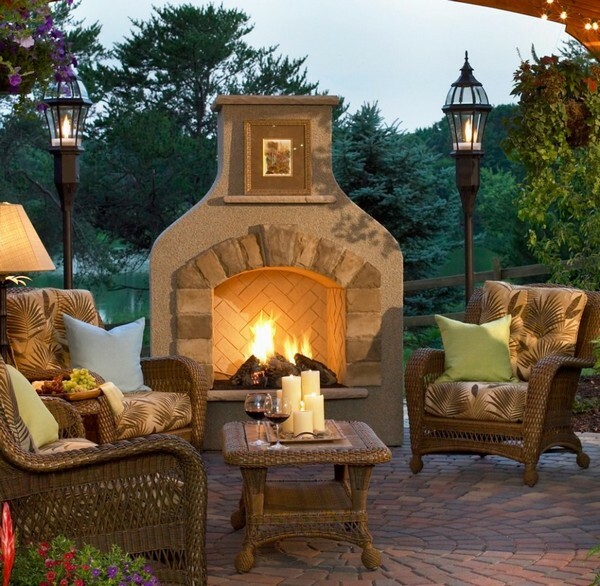 It’s nice to just sit back, relax and enjoy the coziness and ambiance of an outdoor fireplace. What an amazing city view scenery! Can you pour me a glass of wine? 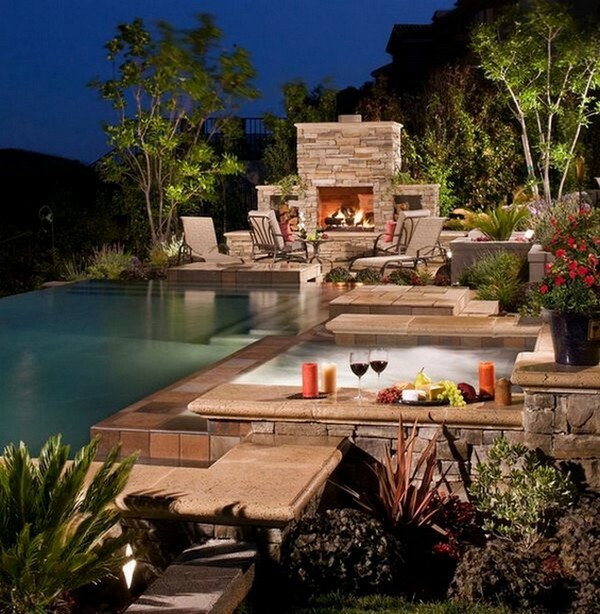 What a wonderful outdoor fireplace design! The entire seating looks gorgeous too! 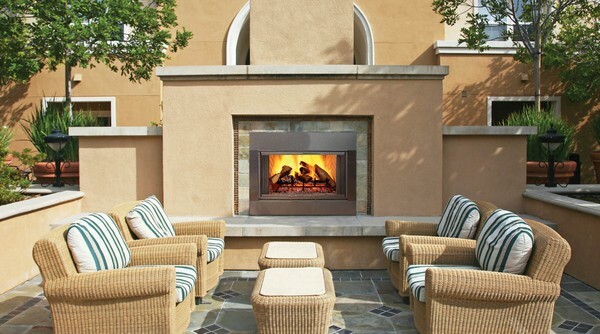 A patio fireplace can provide extra warmth. There are various sizes and designs to choose from. 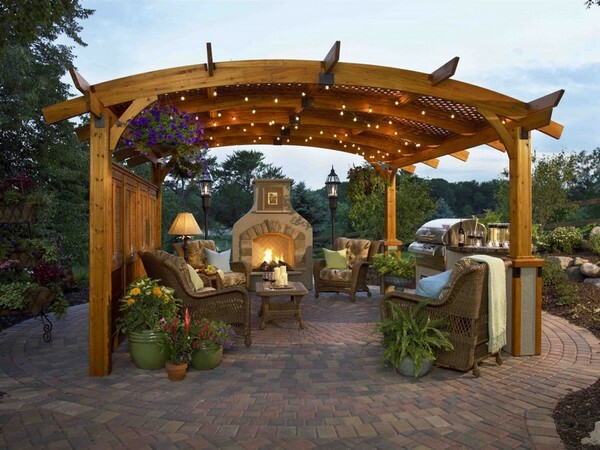 That is why it has become one of the most sought-after addition to any outdoor space. This is an enormous traditional outdoor fireplace design that blends well with its surroundings. Undoubtedly, the main attraction of a fireplace is the fire. A fireplace is an excellent outdoor decor that you can be proud of. 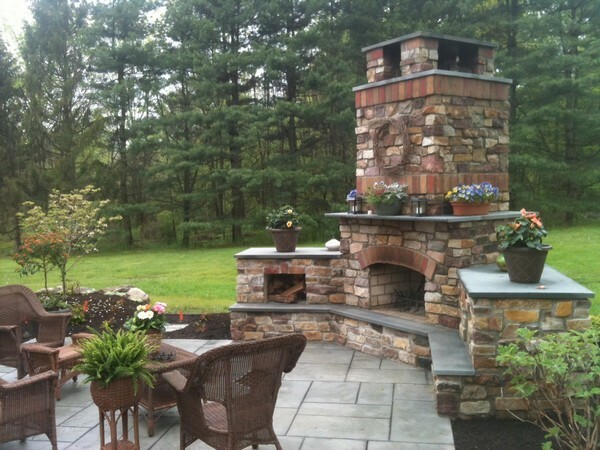 If you are looking for an amazing outdoor look then a fireplace can be a great addition to your landscape. 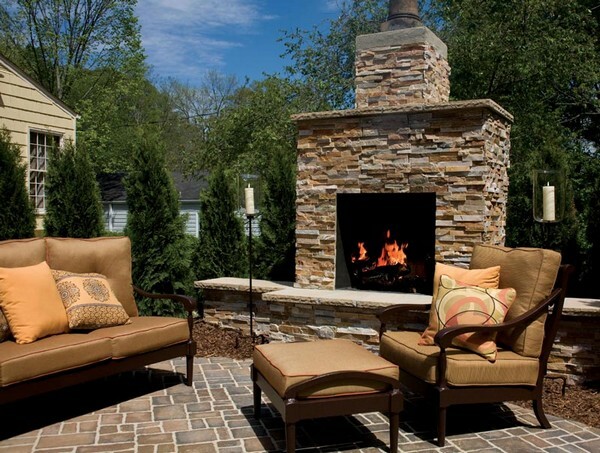 A fireplace can create an excellent outdoor feeling especially when you sit in front of the fire. 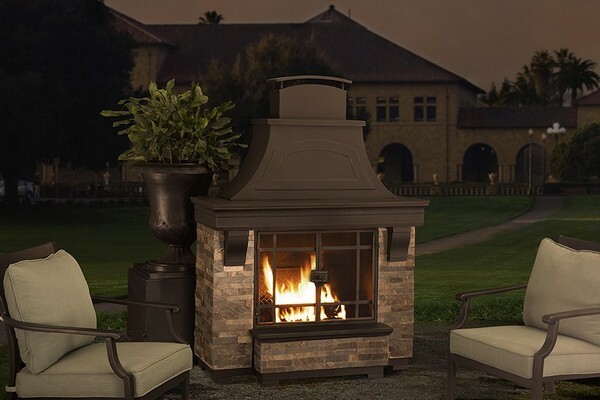 Sunjoy L-OF134PST-B Jasper Fireplace is the best outdoor fireplace. It is versatile and has an ageless design. It is durable and safe. It comes with a spark guard to prevents embers from jumping out. It has a detachable shred to easily throw the ashes. Do you feel that your backyard is a bit boring? 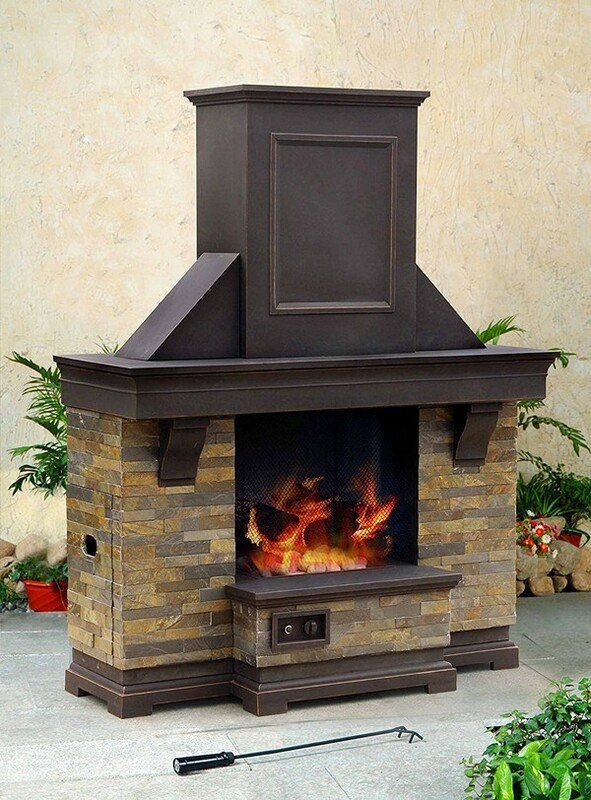 If so then this beautiful fireplace is a nice addition to your backyard. It offers a touch of splendor to your gatherings. Sunjoy L-OF083PST-2 Stone Fire Place is a huge fireplace, giving you an extensive amount of heat. This is an ideal choice if you have a large area. It has a broad and durable base. The fire bowl is made from sturdy steel. The cover is not detachable. There’s nothing better than spending special moments with your friends and family. 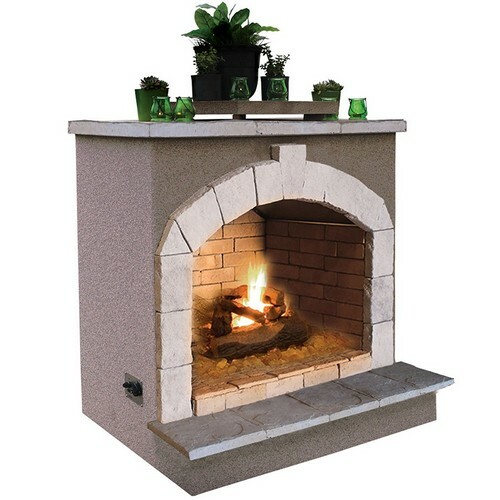 Now you can relax comfortably around a sparkling fire thanks to this stone outdoor fireplace from Sunjoy. 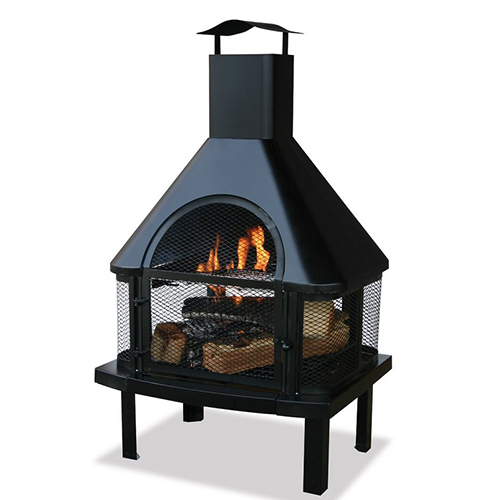 The Uniflame Firehouse with Chimney is a cheap outdoor fireplace that has a black wood fire bowl. Enjoy the ambiance while cooking your burgers on its slide-out cooking grid. 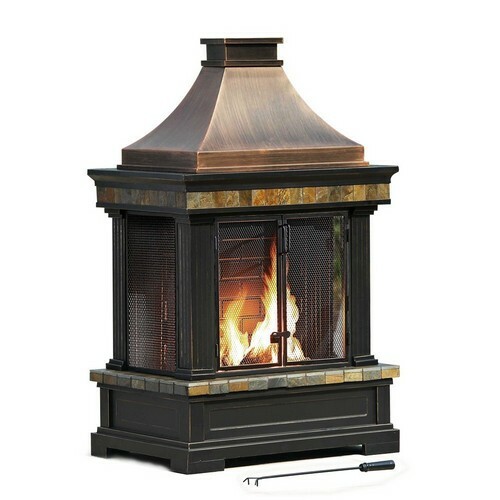 This black Uniflame features a huge chimney which directs the smoke and ashes up. It is made of sturdy cast iron grate along with a vintage black finish. It has a detachable ash collector for easy cleaning. It is covered by a one year warranty. 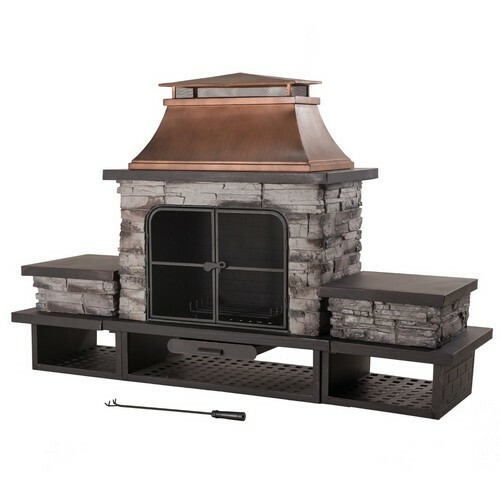 Sunjoy L-OF134PST-B Jasper Fireplace is made of steel and slate. Its fire bowl is made of durable steel. A fire poker is also included for tending the fire. The chimney can keep the fire and smoke up. This is an amazing fireplace that can bring ambiance and warmth to your backyard. The frame is done in an antique black finish while the chimney has a copper finish. The natural slate blends well on the adverse shades of copper and black, making it look astonishing. It has a metal grating that can let the sparks and embers remain inside the fireplace. 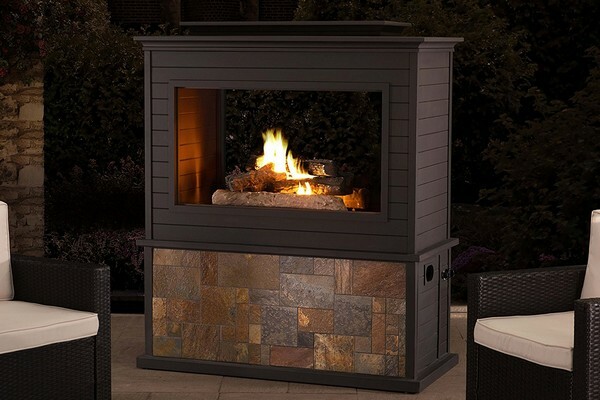 Sunjoy 110505001 Gas Fire Place is ideal for any patios. This is a wood-burning fireplace that has a broad and durable base. It has a functional design and very easy to clean with very low maintenance. This is a handsome fireplace with a black finish. The mantle and base are decorated with slate accents. It has double big doors, making it easy for you to attend to the fire. With its huge chimney, you can’t feel any smoke in your eyes. 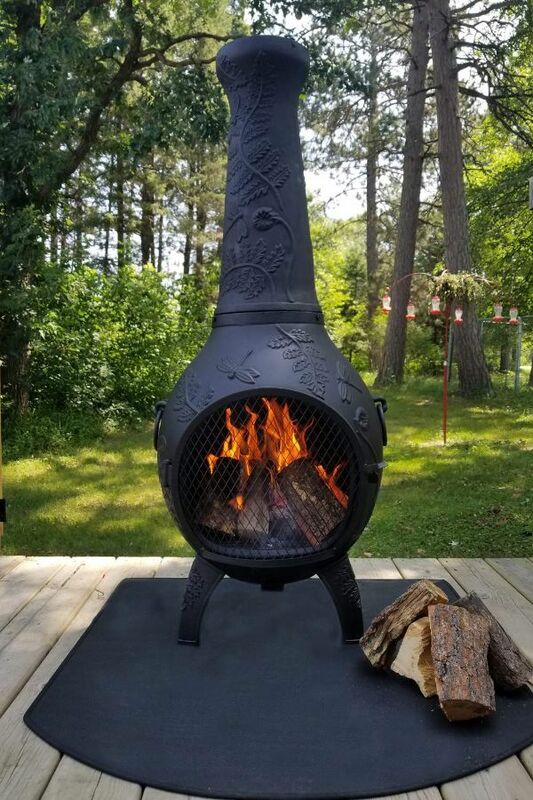 The Blue Rooster Wood Burning Chiminea is built from solid aluminum and coupled with stainless steel. 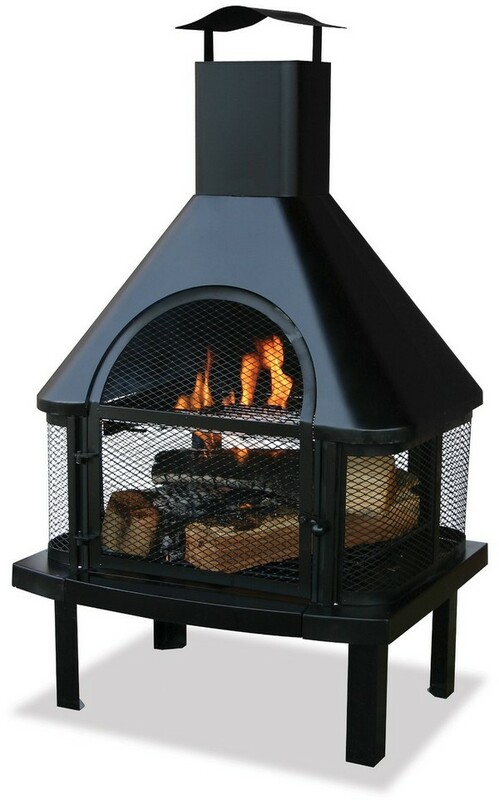 It is a wood burning fireplace perfect for roasting marshmallows at night with your family. Do you feel a little bit chilly at night? If so then you can get the warmth that you need in this cozy fireplace. 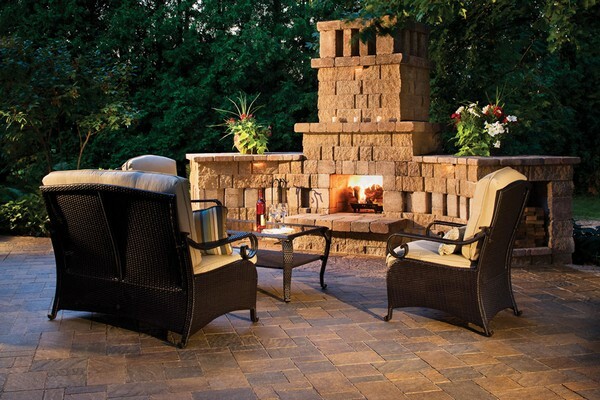 Spend some quality time with your friends and family on your patio, enjoying the warmth that this fireplace brings. 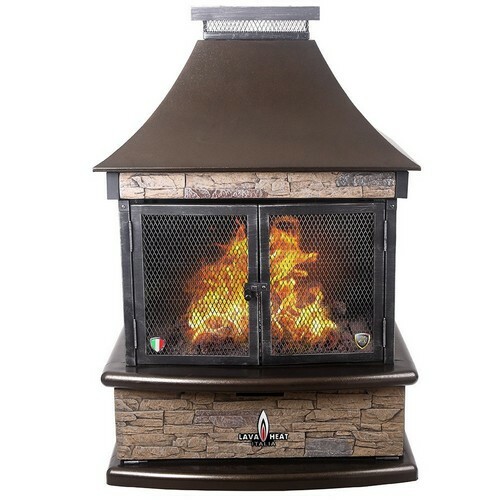 With Lava Heat Italia Natural Gas Fireplace, you don’t need to clean up any firewood. It has a stylish design with an artificial stone and heritage bronze finish. It stands at 4 1/2 feet tall, making it perfect for any covered outdoor area. 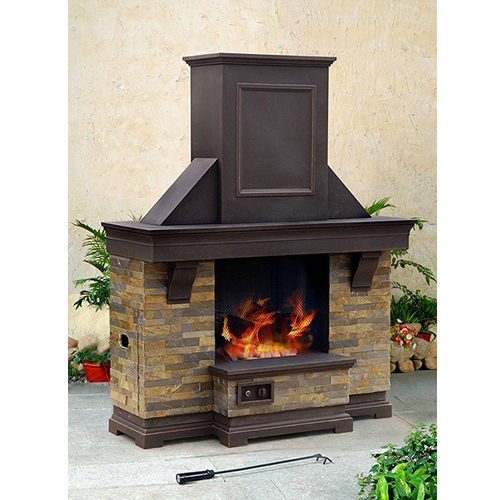 This fireplace can start immediately since it uses an electronic ignition. 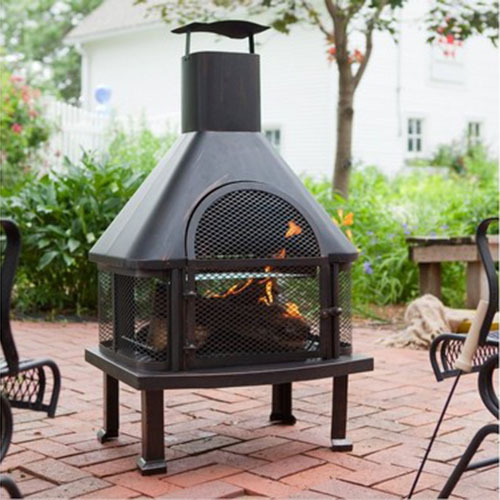 With this portable outdoor fireplace, you can keep the party going while the fire is burning. The Red Ember Outdoor Fireplace has a modern style with teardrop cutouts on its firebox. The control knob is large, making it easy for you to grab. It can start instantly with the use of its electronic igniter. It comes with lava rocks and 3 faux logs. The base is durable and embellished with faux stacked stone design. 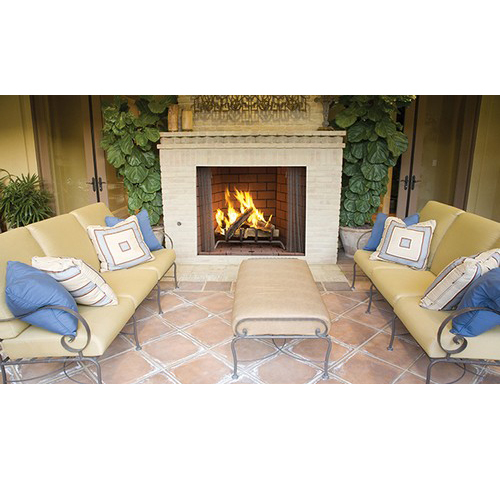 The Cal Flame Gas Outdoor Fireplace includes lava rocks, 55,000 BTU burner and fire log set. This is a liquid propane and natural gas convertible fireplace. It looks impressive and can complement any outdoor panorama. 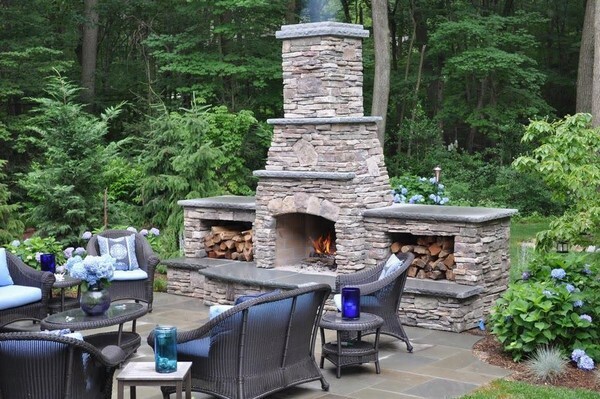 By using this outdoor fireplace, the empty space can become the focal point of your yard. This Superior Fireplaces 42″ Paneled Fireplace is created in ivory stacked brick. It has a traditional style and is covered by a 20-year limited warranty. This fireplace uses the finest brick liners in Warm Red and Natural White. It can be an amazing feature both for indoors and outdoors. 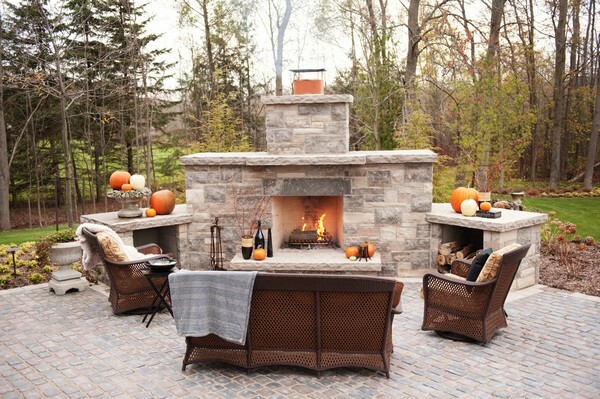 An outdoor fireplace is the best gathering place for friends and family. 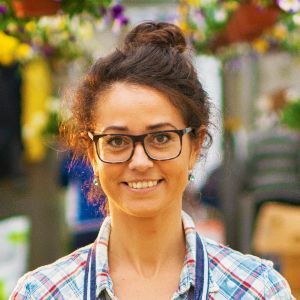 At the same time, it can also be an amazing addition to your outdoor space aside from having wooden benches and outdoor garden lights. Outdoor fireplaces can warm you up during the winter season, however, make sure that it’s safe to use before lighting it up. Which fireplace do you like most? Don’ be shy to share it with us.